In the fall of 1957 our family moved to Blacksburg, VA so my father could earn his Ph.D from Virginia Polytechnic Institute (VPI, aka Va. Tech). I entered the second grade with a northerner’s accent and a reading disability. I had learned to read by rote, which is how they taught us in Rochester, NY where I had spent kindergarten and first grade. I had a good memory and did fine under that system. In Blacksburg they taught reading by phonetics, of which I had not a clue. In the first day or two of the school year, the teacher gave me a reading test and assigned me to the Crow reading group. I did not want to be a Crow. VPI was at the time an all-male, primarily engineering and agriculture institution. Crows were pests; they stole corn. People shot crows. (A useless fact: In my current home state of Michigan there is still an open season on crows with no bag limit. Other times of the year crows may be legally harvested if they are “pests.”) Crows were black (and we are talking 1956 during segregation with separate drinking fountains, etc. for “colored.”) Crows were obviously stupid, since we were the slow readers. I wanted to be a Cardinal. Cardinals were everything Crows were not: colorful, friendly, didn’t raid cornfields, came to bird feeders one or two or a few at a time. Everyone loves a cardinal. Geez-o-Pete—when a bunch of crows get together, we call them a murder. How bad can you get? Human labeling of people and things is often wrong. Cardinals are bird-brained. I’ve watched male cardinals attack their reflection in a car side-view mirror again and again until either someone moves the car or the bird bloodies itself. Another time, in a different place, a cardinal attacked a picture window that reflected light. He repeatedly flung himself at his rival until he finally knocked himself out. 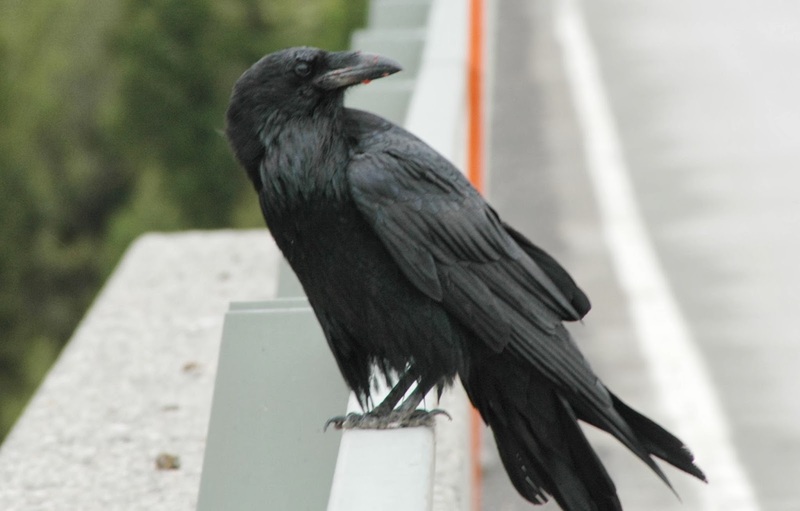 Crows and other members of the corvid family (like the raven above, which I photographed in Yellowstone), on the other hand, are among the smartest birds. They have demonstrated self-awareness in mirror tests (unlike their distant cousins the cardinals) and they use tools. They have been observed using a twig to stir up insect nests and when the insects grab onto the twig, they haul them out and eat the insects. They have learned to crack nuts by dropping them where cars will drive over them. When the coast is clear they swoop in and pick out the nutmeat. A recent YouTube video shows a rook (another corvid) snowboarding down a roof using a lid. By prejudice the teacher mislabeled the reading classes. We should have progressed from the showy Cardinal to the intelligent Crow. Unfortunately, we humans too frequently allow our biases to misinform our knowledge. Too often we mirror the Cardinal and beat our head against something that we take to be a threat because we don’t understand it. Alas, I have to report that by the end of the year I had joined the Cardinal reading group. For years now, I have been struggling to be more like the Crows. Really enjoyed this story, Jim. Hard to believe that teacher's could be so insensitive - even if they didn't know their birds.